Biamp Systems acknowledged its growth and successful 40-year history in the professional AV industry with the opening of a new manufacturing facility. A ribbon-cutting ceremony was held July 27 at Biamp’s new Cascade Building in Tigard, OR. The Cascade Building, which is home to Biamp’s manufacturing and customer support teams, joins the Gemini Building as part of the company’s headquarters. 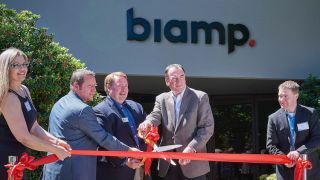 To celebrate the opening of the new facility, Biamp hosted several members of the local and state community, including Tigard’s mayor John L. Cook, who had the privilege of cutting the ribbon. Attendees were provided a tour of the facility, which in addition to office space includes amenities such as an employee lounge and weight room.